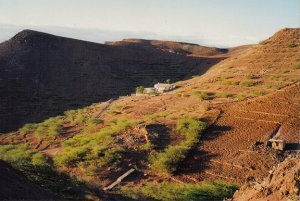 Apart from two extinct volcanos Monte Verde rising 774m and Topona 660m on the East Coast, Sao Vicente is a flat plain. The mountains shield some of the island from the North-Easterly Trades. Discovered on Saint Vincent’s Day, the 22nd January 1492, it was settled from1838 when the British established a coaling station and later a telegraph relay. The bars and cafes of Mindelo reflect its maritime and British history. It is the cultural centre for music, poetry and novels. The British introduced both cricket and golf. Although once well cultivated, farming is now failing due to drought. The golf course - the only one so far in the islands - is on baked mud with browns instead of greens. A lot of English words have made it into the local version of criolu.
. The hinterland is quite empty, but ideal for walking or riding around. "Sao Vicente is a totally different island. 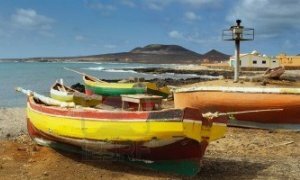 We spent only a couple of days there but did a tour of the island and found some lovely small beaches and fishing villages"
"Sao Vicente was beautiful I hired a taxi driver and he took me all over the island for €30, not bad hey. But all those half built properties just left there. But in the town of Mindelo it is lovely. I went down a quiet road just off the main area to be suddenly followed by two men so before anything could happen I turned round towards them and walked past them unharmed. But if I`d carried on down this dark road looking for a restaurant I am sure my purse would have been robbed." H from Essex liked it best of all. 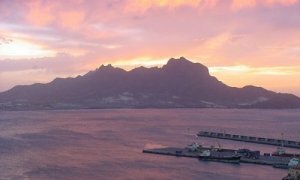 "Sao Vicente was my favourite island. Fascinating mixture of people and incredible landscapes. The Nautical Bar in Mindelo is a must as is Nella's restaurant. Only two negatives, didn't get to meet Cesaria Evora as she had left the day before for Paris and the Hotel Loutcha where the staff seem not to care about anything, all a bit gloomy really. " "Next to Sao Vicente's Airport there is a large beach surrounded by a majestic arid landscape. Foya Branca Hotel faces the beach very closely. The hotel Foya Branca has villas' with great panoramic ocean view. The night fell and we went on to Mindelo, the largest city in the island and the country's second largest. 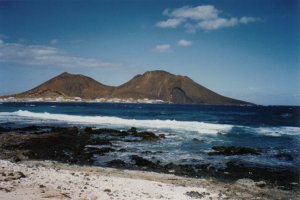 Sao Vicente is a small island compared to others but it is the second most populated after Santiago. Here it is the second largest town in Cape Verde, Mindelo. Mindelo is considered the cultural capital mostly because of music that seems to be everywhere. Mindelo has the most important port in the country which is located in Mindelo Bay. This bay faces the majestic mountains of Santo Antao, the island 1 hour away by boat. On the left side of this bay Mount Cara (seems a human face) looks towards the ocean. 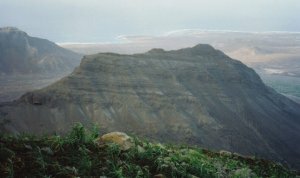 Behind Mindelo it is Mount Verde (Green) that seems to dominate this side of the island. From there one can look at Gatas Bay down there with its famous beach and Music festival site. 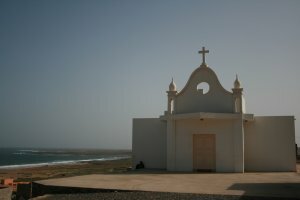 On the other side of the island, the village of Calhau faces the desert island of Santa Luzia. 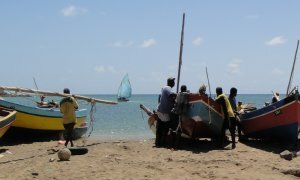 The white, sandy beach of Laginha is where Chez Loutcha, a local restaurant offers beach barbecues on Sundays. 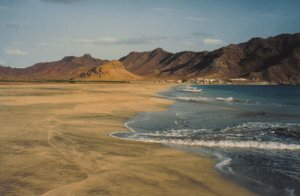 An hour from Mindelo, on the North Coast at Baia das Gatas, sand and shingle form a long beach with a shallow paddling lagoon no more than 1m deep. There are a couple of traditional Portuguese-style restaurants, near the beach. In August it hosts the famous festival of tropical music from all over the world. 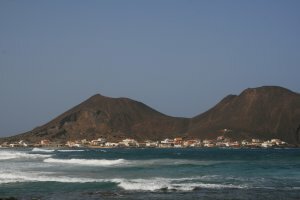 A small fishing village, 10 km from Mindelo beside the airport runway is famous for its beach where a wind funnel offers ideal conditions for surfing. The Foya Branca Hotel is on this windy spot and the sea has large breakers at most seasons.
" Next day, we drove up to Monte Verde from where the view over Mindelo and Baia das Gatas is astonishing. We drove to Calhau at the end of the island to have lunch in 'Chez Loutcha' but it was closed. Back to Mindelo to snack on Azores cheese. That evening we listened to 'Mornas' live and to Discotheque Pimm's and then to Histep, the 'working' disco. At 05:30 we were pushing our Suzuki Vitara without fuel back to the hotel. By 06:00 we were dozing only to get up half an hour later to catch the boat to Santo Antao." On the East Coast, a small fishing village, reached by a tortuous road passing between the peaks of extinct volcanoes. This is the place to eat fish and visit the Caves of Topim. 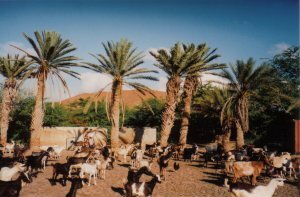 Every Sunday Chez Loutcha provides a buffet meal including transport from Mindelo, from ourtside the hotel. 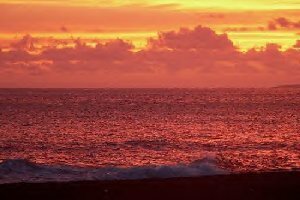 You will have time to explore, talk to the locals who own beach huts and swim. The ride is bumpy and cramped but worth it. A quiet fishing village set some distance from the sea off the road to Baia das Gatas. It has a pretty church and just two bars, where you may have to rouse the owner from his torpor to serve you local beers and of course coke.